High Rise Jeans are back! How are you ladies liking the return of the often called ‘mom jean’? They have definitely made a comeback, and after years of wearing low-rise jeans it can be quite a change! Although they are high-waist, I liked this pair because it has a narrow leg for a streamlined fit that is the perfect blend of comfortable and chic. The fit to wear this season is this one, it rises above the waist, and finishes just above the ankle. 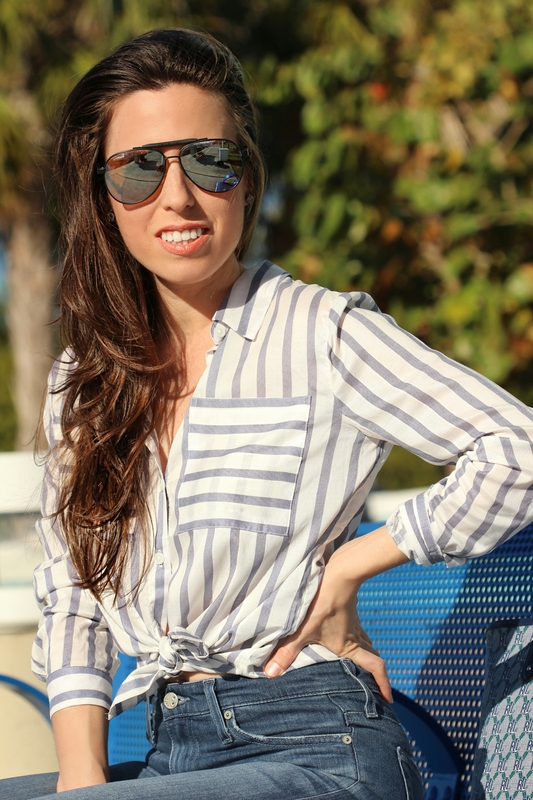 It is easy to style for casual looks, I paired mine with a semi-sheer striped high-low shirt, and then tied it on the front. My intention was to offset the stiff look the jeans have! (The shirt is now on sale). In my opinion, it always comes down to this: wear what looks best on your body shape! There are often many trends that I ignore if I feel they aren’t flattering for my body. I am totally okay with doing that!